Daniel Farke. His name came completely out of the blue. The board could have promoted someone up from the accounts department and their name would have meant as much to me. All the usual suspects who ride football’s managerial merry-go-round were said to have been in the running: Roy Hodgson, Gary Rowett, Mark Warburton, to name just three. But following a selection process overseen by sporting director Stuart Webber, they placed all their chips on a rank outsider. If there’s one thing the Norwich City board loves, it’s an experiment and Farke is another case in point. Webber was sold on him and presumably hoped he would replicate the success of David Wagner, who led Huddersfield to promotion after joining from Borussia Dortmund’s reserve side. And with Delia Smith utterly in thrall to Webber, it was a done deal once the German had expressed an interest in the job. So how has Farke lived up to Webber’s billing since his arrival? Possession has certainly has been at the forefront of his approach and the importance of it is never lost on the players. We pass the ball a lot. Sideways or even backwards, for much of the time, but we like to keep it. We had 70 per cent possession in the opening game at Birmingham and 59 per cent against West Brom. However, the 4-0 drubbing at Millwall last August underlined the fact that in the Championship possession is not ‘nine-tenths of the law’: City had 72 per cent of the play. It’s what you do with it, that counts. Webber swears by Farke’s favoured style, but we move it too slowly to be effective and rarely hit the opposition on the break. There is no element of surprise, one of the reasons why we found it so difficult to break down sides like Burton and Bolton last season. In contrast, Leeds only needed a few quick passes to reach our penalty box and pose a threat, while we knocked it around with little urgency. Webber also cited a mean-spirited back line as a strength of a Farke side and, to be fair, our failure to manage even a top-half finish last season could not be laid at the door of the defence. We conceded 60 goals, nine fewer than under Neil in the previous season, and it was the dearth of goals that led to a goal difference of -11, a stark contrast to +16 the season before. Angus Gunn was one of the players of the season and Grant Hanley’s big-hearted displays earned the respect of fans and the captain’s armband for the current campaign. Now, five games into the new season and we’ve shipped 11 goals and have a goalkeeper whose confidence looks shot. After the hames Tim Krul made of things against West Brom, I would have been tempted to give him a run out in the cup a few days later to let him get back into his stride. Far from putting that sorry episode behind him, he has gone on to make two more gaffes, gifting Leeds two goals before half-time. He is visibly rusty, having made only a handful of performances for Brighton, and I would not risk him in tomorrow’s high-profile fixture. If he risks McGovern and it doesn’t work out, he goes back to the bench and Farke is criticised for not picking Krul. A calamitous afternoon for Krul and there will be no way back for him. As for Webber’s claim that the German would deliver a style and identity the supporters could relate to, this just hasn’t happened. Our style is agonisingly ponderous, a dot-to-dot approach that gets us nowhere. If Farke has given us an identity, I have no clue what it is. Onel Hernandez has bags of skill, but clubs will mark him out of games like Leeds did. Teemu Pukke looks a decent signing and has the kind of pace we so badly need to inject into our play if we are to compete in this division. If we can play to their strengths, and Rhodes can take the chances that come his way, we will cause problems for sides at this level. And that will have to happen regularly if we are to generate the goals Maddison scored and which earned us 20 points – preventing us from going down. What is alarming is that we only finished 14th with a £20m striker and a £10m goalkeeper and midfielder and they’re now gone. Although most of that money is servicing our post-relegation debts and the profligate spending on the likes of Lafferty and Naysmith (who is still costing us an arm and a leg) we have an international goalkeeper and two international centre-halves and yet the defence is leaking like a sieve. Timm Klose and Grant Hanley are better players than that, I believe. So what this season already has in common with the last is that Farke isn’t getting the best from what he’s got and he still doesn’t know his best 11. The pink away dressing room debacle will no doubt be casually shrugged off by those supporters who ‘see no ships’ where the Smith/Wynn-Jones/Webber triumvirate is concerned. But such a public clutching at straws is cringeworthy and opposition managers could do worse than simply point at the supposedly calming paintwork just before their players head for a final injection of motivation. Also, telling every club in the division you’ve done it, rather than letting it come as a surprise, bordered on ridiculous. Our Carabou Cup win at Cardiff was a welcome one after the harsh reality check delivered by Leeds. But Farke needs another win tomorrow at Portman Road if he is to lift the collective mood ahead of the international break. Paul Hurst’s appointment was positively received by Ipswich fans, but they are winless and bottom going into the derby. Farke dodged a bullet last season when Klose’s last-gasp equaliser prompted scenes of wild celebration and that now infamous Radio Suffolk commentary. While last season was perceived as ‘transitional’, this one is not and a defeat to such a weak Ipswich side would really set alarm bells ringing. This entry was posted in Uncategorized and tagged Daniel Farke, Delia Smith, Norwich City, Timm Klose on September 1, 2018 by Richard Balls. A lone voice spoke up against the Norwich City heirarchy at the recent agm. Opposing the re-election of Delia Smith and Michael Foulger to the board, shareholder Robin Wilson said he had absolutely no confidence in their abilities and suggested they step down. Needless to say, their reinstallation was approved by an almost unanimous vote and the moment had gone. Such acts are seen as heresy by those in Smith and Wynn Jones’ inner sanctum and those on the terraces for whom they can do no wrong. Just like those who refused to stay for the lap of honour in 2006 or waive their rebate after the club crashed into League One three years later, those who don’t sing from the official hymn sheet are made to feel lesser supporters. The majority shareholders are now hideously out of touch with modern football, but they are no doubt told by those who have their ear in expensive restaurants and the directors’ lounge to sod the begrudgers. Those who want a change of ownership just don’t know how lucky they are to have owners like them and would see the club flogged off to some unscrupulous foreign investor who has never so much flown over Norwich. Fans of so many other clubs with would give their eye teeth to have British owners with such passion and commitment. So the argument goes. Oddly, given the sharp downturn in City’s financial position, the shareholders didn’t raise the question of possible future investment, but the chairman did. Although the club had not been proactively seeking investment, “if there are people who believe in this football club and want to invest in Norwich City, our door is open,” he said. And thereine lies the problem. Even if there is someone out there who is prepared to pour their millions into the club, they are unlikely to want to do that without acquiring any shares or having a significant say in the boardroom. Yet it is clear for all to see that the current owners are going nowhere any time soon and when they are ready to stand aside, it will be to the one person who can be relied upon to run the club their way. So, in effect, we have a stalemate. The current owners are done with investing; in fact last year the club repaid the £1,529,000 they were owed in outstanding loans and a further £460,000 to Michael Foulger. But the likelihood of the club attracting a wealthy investor under the current set-up remains slim to non-existent. The Times interview was an own-goal of mammoth proportions, alienating many fans. Its timing, just before an agm, was especially poor and the comments made in it ill-judged. Much of the piece involved Smith bemoaning how badly fans in general were now treated and calling on the government to cure football’s ills. “I’d love to see supporters worshipped and respected because otherwise it’s going to end up on television,” she said. Just weeks later, tickets to see Norwich take on Southampton’s second-string in the FA Cup third round went on sale priced £25 for adults and caused a furore. An apology was given, along with free travel for the replay and then chief executive Jez Moxey, who was blamed for the fiasco, was shown the door soon after. However, the damage was done. Finally, if you’re all about running Norwich as a “community football club”, why mark your 20th anniversary by giving an interview to a national newspaper which operates an online paywall? Why not give a rare interview to the media which actually serves the local community or – if they are not be trusted – set out your stall about the future direction of the club in the matchday programme or on the website? Last summer, Ipswich wrote to all other Championship clubs offering to cap the price of tickets for adult visiting fans at Portman Road at £25 if Town fans were charged the same for the reciprocal fixture. Clubs not taking up the invitation would have to pay the standard price. Twelve clubs reportedly agreed to the arrangement, but Norwich was not among them, leaving Smith wide open to accusations of hypocrisy. Charity, after all, begins at home. 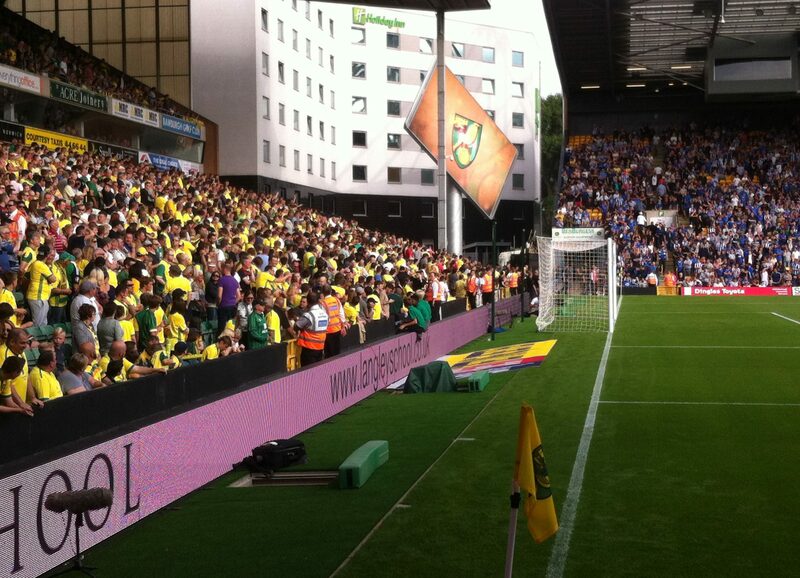 The number of empty seats and sombre atmosphere at Carrow Road of late has been alarming. Seven home games without a win before the 3-1 turnaround against Sheffield Wednesday last night and some dire football has led to some staying away and others leaving early. Last season some decided not to renew their season tickets and other are muttering about doing likewise this January. If prices have to go up to cover the gaping hole in our finances, some won’t be standing or sitting next season. Charlton Athletic was once City’s role model and unless something gives, we could end up following it in a way the board never intended. This entry was posted in Uncategorized on December 10, 2017 by Richard Balls. So, the deed is done. Alex Neil is gone. The question is, why now? To allow him to go ahead with his Friday press conference and talk about his thoughts ahead of a game it had clearly been decided he would not oversee, is odd. Insensitive, some might say. Few would have seen that in the morning tea-leaves, including Neil himself, especially given the events of the past fortnight. But then this is Norwich City, a club that prides itself in doing different, that continues to hold to values which football threw on the fire long ago. Like continuing to back a manager who at any other club in the known world would have been relieved of their duties. “My dream is to have a manager for 10 years”, Delia Smith told Times journalist Henry Winter back in November. Such sentiment, however laudable, has no place in the modern game, and yet time and again it has informed key board decisions. Neil deserved better than today’s shabby ending and he would have got it if they had pulled the plug months ago. We will all have our own view on when that should have been. Some felt the defeat to Huddersfield just before Christmas should have been the turning point and a chance to let someone else take charge before the transfer window opened. A poor home result is always more damaging for a manager than an away one, after all. For others, the total no-show at Rotherham, a side then six points adrift at the bottom of the table should have proved too much for the board to stomach. How could we mount a promotion charge if we couldn’t get so much as a point there, fans were left to ponder? Then there was the debacle at Burton Albion and the draw with one of the most impotent Ipswich teams in living memory, only Jacob Murphy’s equaliser preventing the post-match atmosphere outside Carrow Road from turning toxic. All of which meant Sheffield Wednesday was a game of huge importance, especially when City had been unable to mix it with all other top-six sides. In the event, the board and long-suffering travelling fans witnessed City pants not so much being pulled down as entirely removed. Yet on Monday morning Neil was still very much in charge and preparing for the trip to Bristol City, where his charges would again come up short. So why was he allowed to drag us to a point where all hope of a play-off place had died? The second season ticket deadline- by pure coincidence – is today (Saturday 10 March) and while the owners’ patent desire was to cling on to their man, a sharp drop in season ticket sales will have caused furrowed brows, even in their Ivory Tower. Relegation followed by another dogs’ dinner of a season has caused even some stalwart fans not to renew and with a home game today, Neil has been sacrificed in the hope it will persuade them to ‘stay part of the family’. Ultimately, the ham-fisted timing proves this is a board that never learns from its mistakes. Worthington was kept well beyond his sell-by date because Delia and Michael had allowed him and his wife to become too close to them, leading to steeet protests and a poisonous finale at Carrow Road.Gunn should have been sacked in the summer after the team tanked and slid into the third-tier of English football. He wasn’t and the ghastly events of that opening game against Colchester unfolded. They clung on to Houghton, but then jettisoned him with five games left when it was all too late. This time, in a season when it was crucial we made the most of the strong squad still available post-relegation, heart has again ruled head and valuable fixtures have come and gone. Neil’s achievements must not be forgotten. He did what few City managers have done by winning a big occasion and the confidence with which we despatched Middlesbrough at Wembley will live long in the memory. All managers have a shelf-life and after relegation and a deeply uninspiring Championship season it was clear Neil had reached his. But the decision-making off the pitch, as well as on it, demonstrates the club’s problems extend far beyond the dugout. This entry was posted in Uncategorized and tagged Alex Neil, Delia Smith, Norwich City on March 10, 2017 by Richard Balls. A defensive blunder led to the first goal. Not only that but it was committed, in the view of the manager, in a “stupid area”, and from our own throw-in, if you don’t mind. The culprit was Timm Klose and he was full of apologies in the dressing room at half-time. Such individual lapses can’t be legislated for and Alex Neil will have been as frustrated as the fans watching and listening in. Sadly, gaffes have been a feature of this season so far and the defensive jitteriness that so carelessly handed three points to Burton is threatening to write off any chance we have of a top-six finale. The key to mistakes is you learn from them. And in that respect, the manager and players have singularly failed. It was just six minutes before Ruddy was picking the ball out of the net at Brighton, seven at Rotherham and five at home to Huddersfield. People were still buying pies and making their way to their seats when Newcastle drew first blood after, ahem, 23 seconds. Early lapses of concentration and the sound of battle plans being ripped up in the dugout are nothing new. On the road, our focus seems to go completely. Only Forest and Rotherham have now conceded more league goals away from home this season and the reason we are seventh and even talking about the play-offs is that we are the second-highest scoring team, behind Newcastle. Learn to defend and we’d be in the top two. So, why can we not keep clean sheets? Is it down to the players or because of the way the team is set up? I have long believed strong sides are built from the back. Get a solid spine in place and you’ve got a chance, especially if you can do it before the season starts. Rewind to the summer of 2015 and Neil signed young goalkeeper Jake Kean and three midfielders – Graham Dorrans, Joussouf Mulumbu and Robbie Brady. No move to strengthen the defence was made until January, when Klose was flown in from Wolfsburg and Ivo Pinto from Dinamo Zagreb. By then much of the damage had been done. There was, briefly, an indication that Neil was not going to neglect the defence for a second consecutive summer break. Young French defender Jerome Onguene was reportedly in the directors’ box for our opening home game against Sheffield Wednesday, but in the event he remained at Sochaux. The only defensive arrival at Carrow Road was Michael Turner, back from his most recent loan spell at Hillsborough. In an office somewhere, Steven Whitakker meanwhile signed a one-year extension to his contract.Whoopee-do. Neil once again waited until the January sales – a notoriously difficult environment to sign players – to bring in Mitchell Dijks on loan from Ajax to replace the departing Martin Olsson. The 6ft 4ins tall left-back looks a decent acquisition if early indications can be relief upon. But in terms of automatic promotion, that ship has sailed, and the Dutchman joins a side for which getting into the play-offs will be an uphill battle. We might yet do it; stranger things have happened. But if we don’t, Neil’s failure to invest properly in a defence prone to the jitters and before the campaign began will be the most obvious place to start any post-mortem. This entry was posted in Uncategorized and tagged Alex Neil, Burton Albion, Ivo Pinto, Michael Turner, Mitchell Dijks, Norwich City, Steven Whitakker, Timm Klose on February 19, 2017 by Richard Balls.